Aiki Journey to Self-Mastery. (SB) 94 pages. SUPER MIND TRAINING FOR MARTIAL ARTS. SHOTOKAN KARATE HANDBOOK. Beginner to Black Belt. 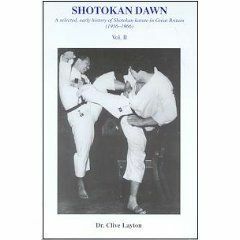 Continuing with Vol II of Shotokan Dawn, which covers the establishment and subsequent eight years of Shotokan Karate in Great Britain, Vol II of this work examines the following momentous years, 1965-1966, and the dramatic effect that the introduction of Japan Karate Association instruction had on the British Shotokan movement. Once again, using BKF documents as a backbone, Dr Layton, incorporating a phenomenal amount of material, weaves a wonderfully readable account of events, including interview material not only with Vernon Bell and Masters Kanazawa are witness to those inspirational years. Without doubt, Shotokan Dawn is the definitive work on the early history of British Shotokan Karate.